NOTE: Since the first portion of this year's essays has turned into an overview of the Universal cycle, I would be remiss in leaving out a few films that I have previously covered. This is not meant as a cheat, but rather as a nod toward keeping things complete. This entry is from last year, so forgive me if you've already read it. "Even a man who is pure in heart and says his prayers by night may become a wolf when the wolfbane blooms and autumn moon is bright." Poor Larry Talbot (Lon Chaney Jr.) finds this out in no uncertain terms. 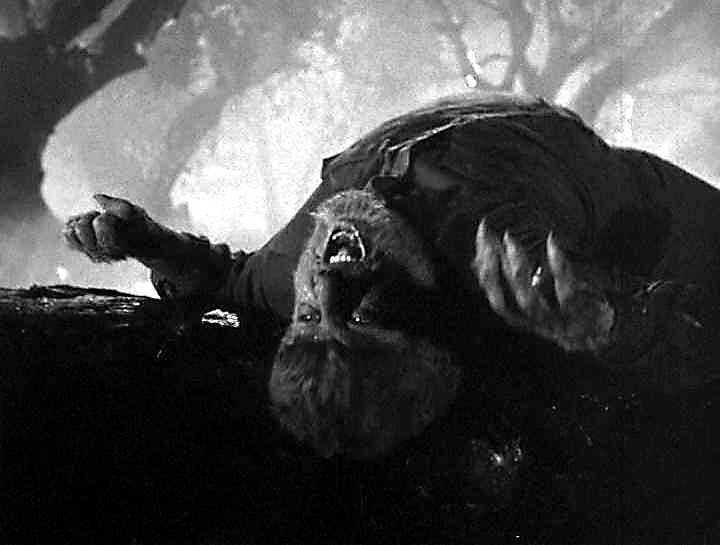 There are very few horror films that could be considered as perfect in every way and 1941's THE WOLF MAN can be counted among them. Though the classic Universal horror entries that preceded it are seminal works that defined the genre for a couple of decades, all of them — with the notable exceptions of BRIDE OF FRANKENSTEIN and WEREWOLF OF LONDON (both from1935) — bore the earmarks of cinema that was only just finding its way after the advent of sound and the demise of the silent era. They tended to possess the feel of stage plays, often featured exaggerated/over-the-top acting and melodrama common to the era, and also suffered from issues of slow pacing (or at least slow when compared to what we're used to from the 1940's onward). 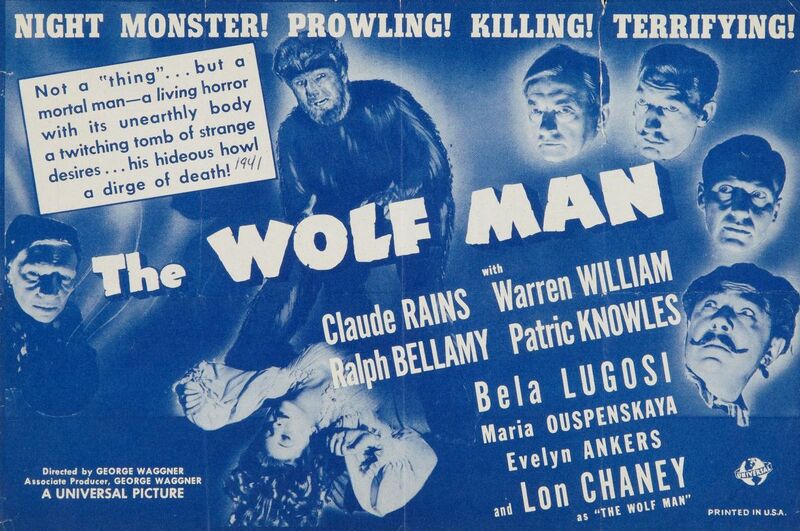 THE WOLF MAN benefits from coming a decade after DRACULA and FRANKENSTEIN in that it's a more modern and sophisticated piece. Though lacking that dark fairytale quality that flavored its antecedents, THE WOLF MAN more than makes up for that with moody atmosphere to spare, a pervasive air of impending dread, and a terrific and grownup script by Curt Siodmak that brings the audience characters whose actions and motivations are quite realistic, especially when seen within a horror movie context. THE WOLF MAN is arguably the most influential werewolf film ever made and its impact continues to reverberate some seventy-four years after its debut. 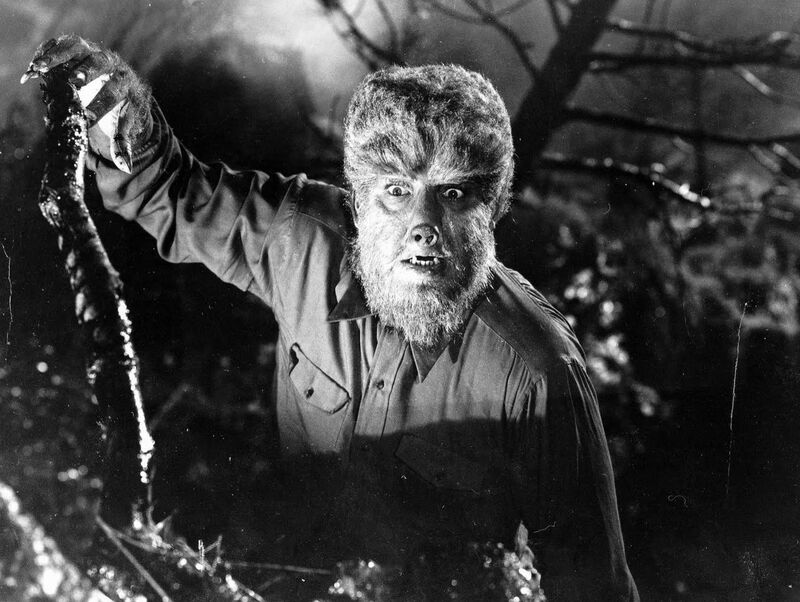 Though Jack Pierce's pioneering makeup effects have long since been eclipsed by superior techniques in prosthetic effects, animatronics, and digital wizardry, it says a lot that THE WOLF MAN would still be an effective film if the wolfed-out version of Larry had been achieved with naught but some glued-on barbershop floor sweepings and creative lighting. The film's true strength lies in its script and soul, so if you have not yet experienced this Rosetta Stone of lycanthropic pop cultural lore, I strongly urge you to see it for yourself as soon as possible. In its sequels, Larry proved to be immortal and THE WOLF MAN itself also endures.